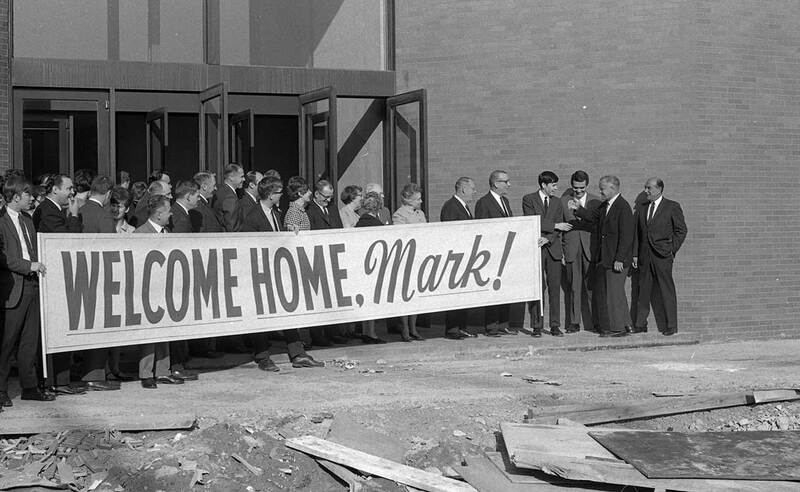 RIT President Mark Ellingson was greeted by staff with a huge sign reading “Welcome Home, Mark!” on his first day of work at RIT’s brand new campus in Henrietta. His arrival and the official opening in the fall of 1968 were the culmination of nine years of intense planning, fundraising and construction. Planning for the new campus was a painstaking process. Multiple groups played a part, from Ellingson, the Board of Trustees, faculty and staff, to the architects, engineers and construction firms. Many details had to be coordinated, and reading through the records in RIT Archives elicits a sense of awe at the magnitude of the project. Details such as connecting the sewer system to the town of Henrietta, which would generate cost savings over building a separate system, all had to be debated and decided. A team of five outstanding, internationally known architectural firms, some with extensive experience with higher education, was chosen to collaborate on the design. Landscape architect Dan Kiley worked on the overall plan of the campus. Everything about the design was planned, from the unifying rectilinear design, the choice of brick and the carefully planned pedestrian walkways and courtyards. The proximity of the Genesee River and Red Creek, both prone to flooding, contributed to siting the campus on two eskers, putting the buildings on high ground, with the residential area on the east and the academic buildings to the west. Work on individual buildings was apportioned among the five firms. Most of the planning and design took place from 1962 to 1964; the first signs of construction did not even occur until the grading began in June of 1964. The new campus forever changed RIT’s character. No longer an urban campus, the university now had academic buildings for each college equipped with adequate laboratories and classrooms, a large student union, athletic fields, a gym, dormitories to hold 4,000 students and an equal number of parking spaces. The scale of the finished campus and buildings would feel immense after the tightly-packed environs of the city. In September of 1968, students, faculty and staff started the school year in new quarters. A weekend of celebration marked the official opening with invited dignitaries from across the country, an academic convocation, official dedication ceremony, alumni banquet and trustee dinner. Thousands of Rochesterians also toured the new campus. In his speech at the campus dedication, Ellingson declared “the future is absolutely tremendous” and called the campus “a launching pad for a new, exciting and challenging era.” Capping off the year, 10 members of the RIT cross-country team ran a relay with a lighted torch from Washington, D.C., to RIT in 94 hours and arrived on campus to a jubilant crowd of cheering students, staff and faculty. The move to Henrietta would catalyze the many changes to come. A new chapter had begun. RIT alumni who attend the university when it was located in downtown Rochester share their memories from the old campus 50 years after RIT relocated to its current campus in Henrietta, NY.